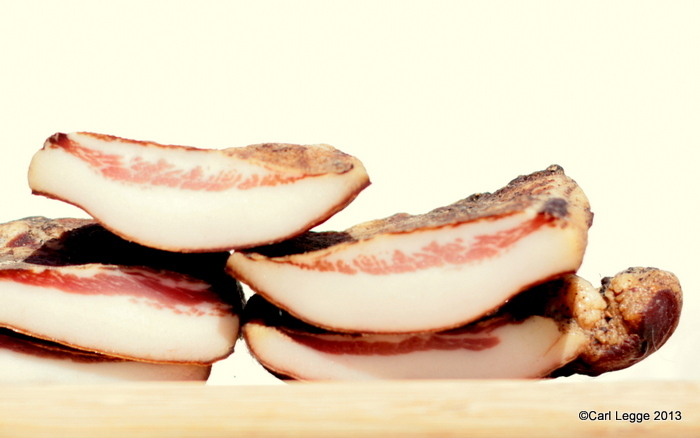 Guanciale is the perfect preserved pork. 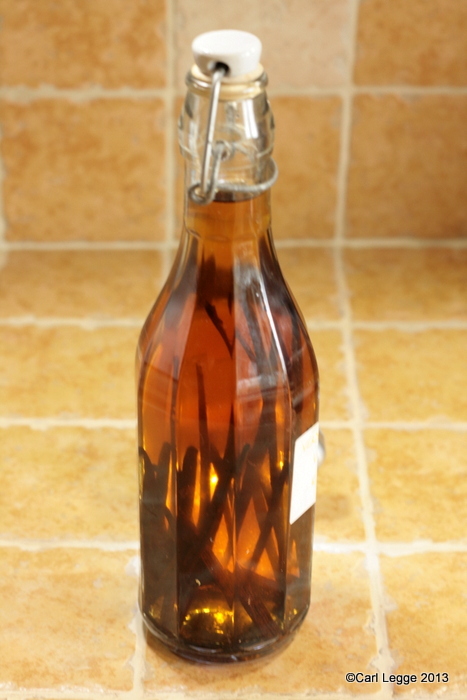 It’s wonderfully versatile & tasty, easy to make, economical to buy & use and looks brilliant. What’s not to like about that? You can see what I made in the picture above: I’m so pleased with the result. At the end of February I was fortunate to meet Huw Roberts of Oinc Oink our very local award winning pedigree Welsh pork producers. At their stall Huw had brought along some pig cheeks on the off chance that they might sell. They did. Cheesy, garlicky soda bread made w/blight resistant Blue Danubes sounds fab, but where is the recipe? 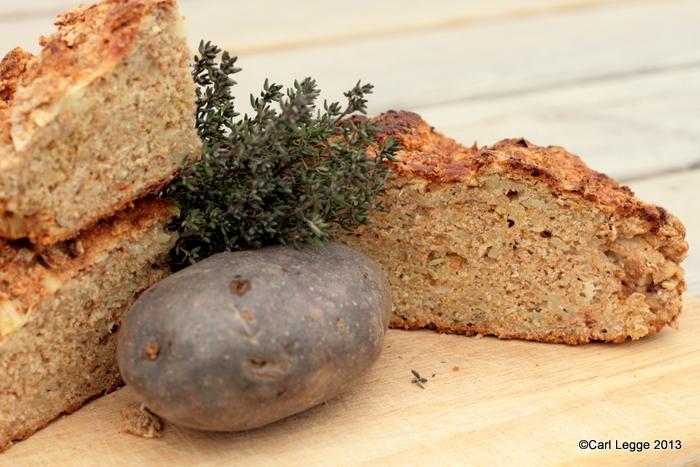 Any new take on soda bread ROCKS for us Irish, especially if it incorporates SPUDS…Send a link pronto! The Blue Danube potato are a part of a selection of potato varieties I am trialling for the far-sighted people at the Savari Research Trust who are developing these highly blight resistant potatoes. These potatoes are more sustainable to grow because they do not need the frequent chemical treatment and other energy dense maintenance of conventional varieties. As you can imagine, that’s a tough gig. 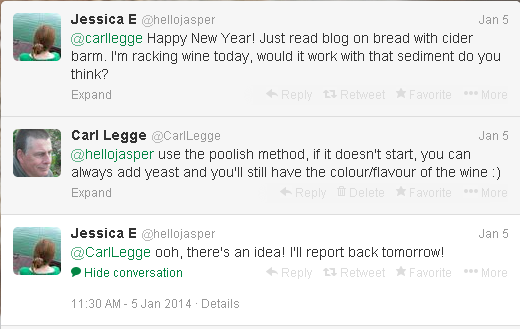 Specially as I’m trying to come up with some novel recipes too. This bread is almost addictive. The potato in it makes the bread moist and tender unlike many soda breads that can seem hard and dry. The mixture of cheese, garlic and thyme makes it wonderfully savoury. It’s great as it is; slathered with good butter; toasted and topped with a fresh poached egg or eaten with (leek & potato) soup. I love the way Twitter works. In particular how ideas get propagated: across the world in an instant and inspiring new networks of enthusiastic people. And also how physical things are shared too. This kefir bread is the result of both such things. My apologies for the pics – they’re taken quickly on an iPhone and the bread didn’t last long enough for me to take anything posher for you. I sent Joanna at Zeb Bakes in England some kefir. 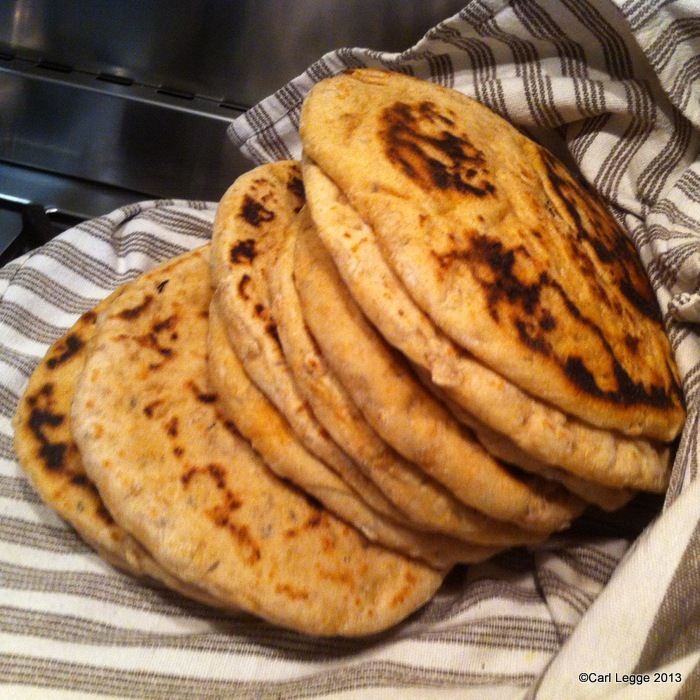 As part of her experiements, Joanna (a great baker) decided to make kefir leavened bread blogged by her friend Cecilia. Joanna has written a very instructive blog post about her experience. And Cecilia is a Kiwi (New Zealander) living in mid-west USA. So, with all this helpful stuff to read, I had to have a go at this. As you can see from the pictures, the loaf turned out very well indeed. 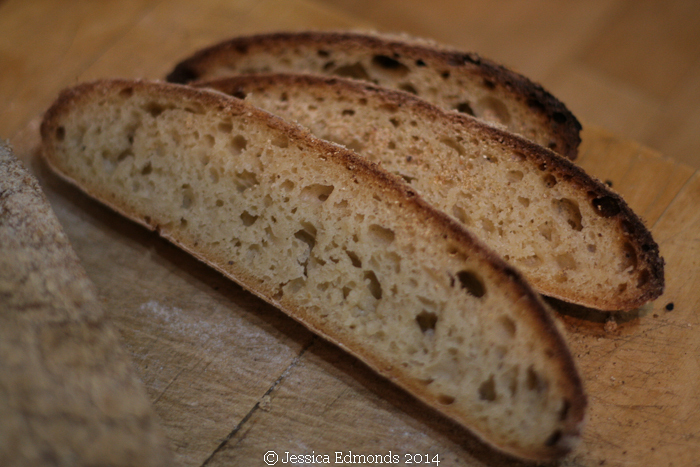 It was a soft bread (apart from the crisp crust), slightly sweet with a background tang. It makes lovely sandwiches and toasts well (browns very quickly). We had it au naturel, with marmalade and toasted with cheese and it went well with all of them. You need to think a couple of days ahead as you need live kefir milk to start fermenting a flour ‘sponge’. You then add this sponge to a bigger quantity of flour to ferment the final loaf. Here’s a quick and easy pitta bread recipe as requested by my kind and talented Twitter friends @evilgordon & @karlasparlour. I served it with a tasty lamb tangia slow cooked for 7 hours and which had some of the Smen I blogged about earlier. 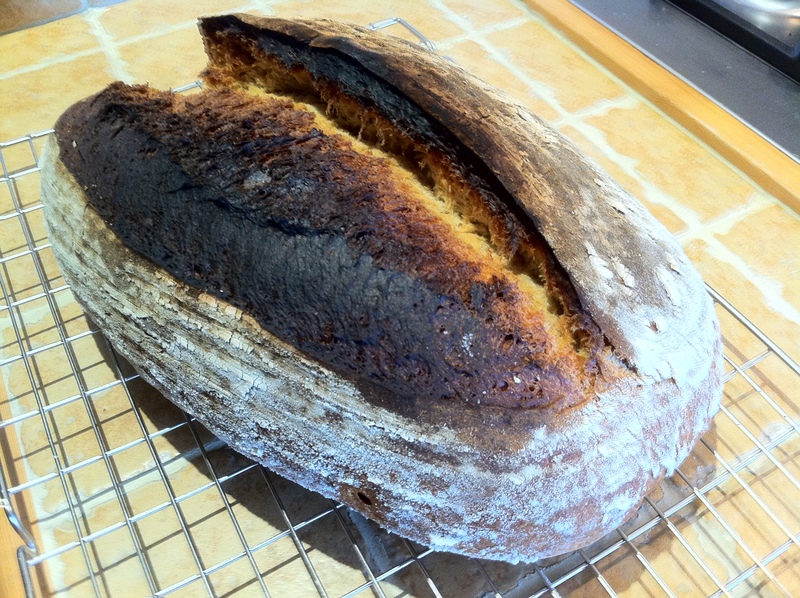 The method is one I’ve borrowed from Dan Lepard, it saves a whole lot of faffing with the old ‘knead for 10 minutes’. It’s not necessary. Add the olive oil and rub in to the dry ingredients. Add the water and mix well. You want to make sure all the dry ingredients are wet and the dough is mixed, that’s all. Cover with plastic or a tea towel and leave in a warm place for 10 minutes. Do what I call a quick ‘Compass Knead’. Imagine the dough is a compass, pull in to the centre of the dough from N, E , S, W and repeat. Cover again, leave in a warm place and repeat the Compass Knead twice more at 10 minute intervals. Cover the dough and leave for 30 minutes in a warm place. Take out the dough and scale it into approximately 110g pieces, you should get 12 pieces. Leave the 12 pieces on a floured board to rest for 15 minutes. Roll out the pieces of dough so that they are about 5mm thick and 15cm in diameter. I cooked mine on a hot cast iron tava taking about 2 minutes for each side. They could be cooked on a tray or baking stone in a very hot oven for about 3-5 minutes. Put the cooked pitta in a clean tea towel to stay warm and moist. Morocco has a special place in my heart as that’s where I had my honeymoon well over 20 years ago. Since then, I’ve maintained a keen interest in Moroccan & other North African cuisine. One of the ingredients that is traditional to this part of the world is Smen (also called sman, semneh, or sminn) which is a cultured, salted and flavoured butter which keeps for ages. It’s normally made from sheep or goat’s milk. You’ll see it used to spread on flatbreads, to flavour tagines and cous cous. Jamie Oliver uses it for his recipe for mechoui lamb that I wanted to cook, so I decided to see if I could make my own smen. Most of the recipes for it that I have found on the web and in my book involve clarifying butter. This is then kneaded with salt and an infusion of herbs (oregano or fenugreek). 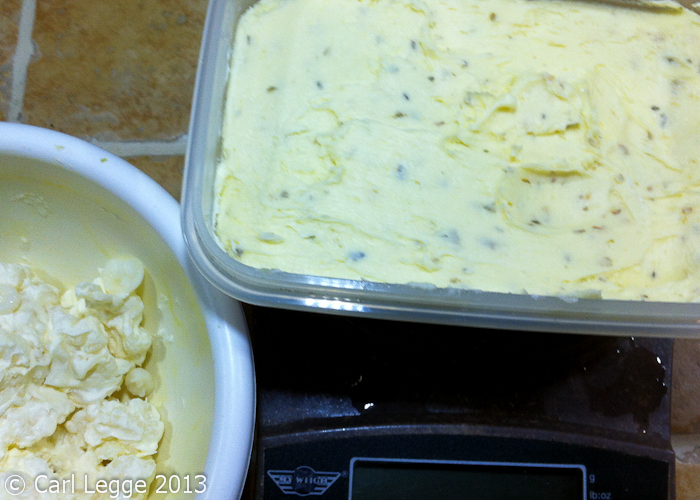 The butter is then packed and sealed and stored to mature. In others unclarified butter has the salt & herbs added and it’s then clarified. The web tells of Berber herds people who will bury a sealed container of smen on the day of a daughter’s birth, aging it until it is unearthed and used to season the food served on that daughter’s wedding. I’ve no idea if this is true. In my last blog post, I showed you how to use this versatile vegetable. As promised, I’ll tell you how to grow them in this post. We found these very easy to grow last year even with all the rain and lack of sun. Puntarelle are glorious to eat. 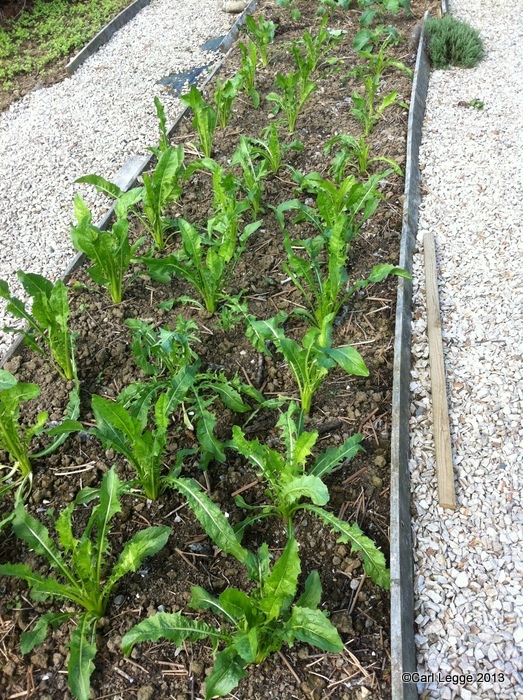 This type of chicory is a versatile vegetable which you can eat raw or cooked. It’s also a doddle to grow. We grew it for the first time last year and it will be a firm favourite for the future. You may see recipes for Puntarella, with an ‘a‘ at the end. However, to be precise, Puntarella is the Roman Italian word for little shoot. So puntarella is one shoot, and puntarelle – with an ‘e‘ at the end is the plural and means many shoots. 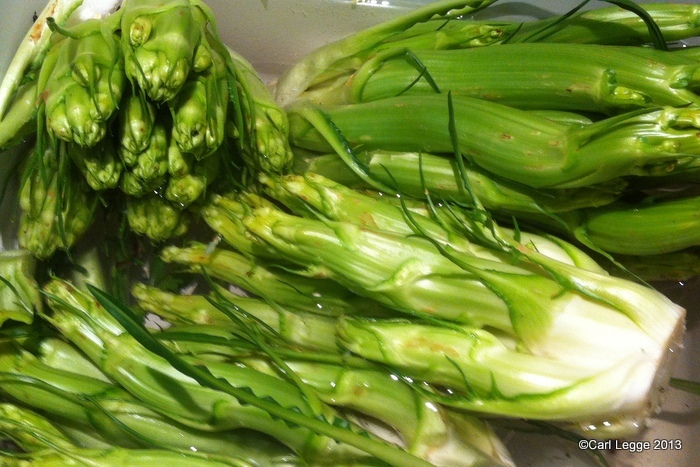 We’re nearly always eating many, so the recipes use puntarelle. You may see the plant or seeds described as Cicoria (di) Cataglogna, Cicoria di Gaeta or Cicoria Asparago (asparagus chicory). As far as I can find out, the Cicoria di Veneto is a leaf only chicory like an endive and without the shoots. And some of the Cicoria Cataglogna seeds on sale are leaf only chicories. So be careful. In my next post, I’ll give you one UK source for the seeds for the right stuff. 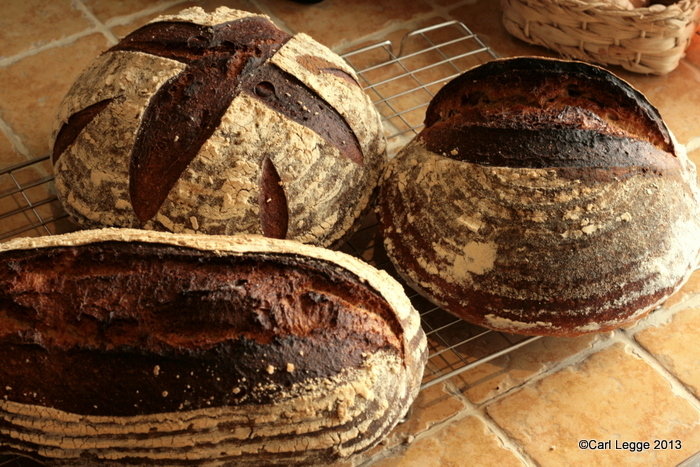 These three sourdough loaves are made with Doves Farm English Wholegrain Wheat flour mixed with Shipton Mill’s Organic White Strong Flour. I made up the dough yesterday and folded it four times and about one hour intervals and then left it in the fridge overnight to retard. This morning I took the dough out of the fridge to warm up while I had my breakfast, divided the dough and left it for 30 minutes. Then shaped them and put them into bannetons. They proved in a not so warm kitchen for about three hours before baking for 50 minutes with some steam trays to start.